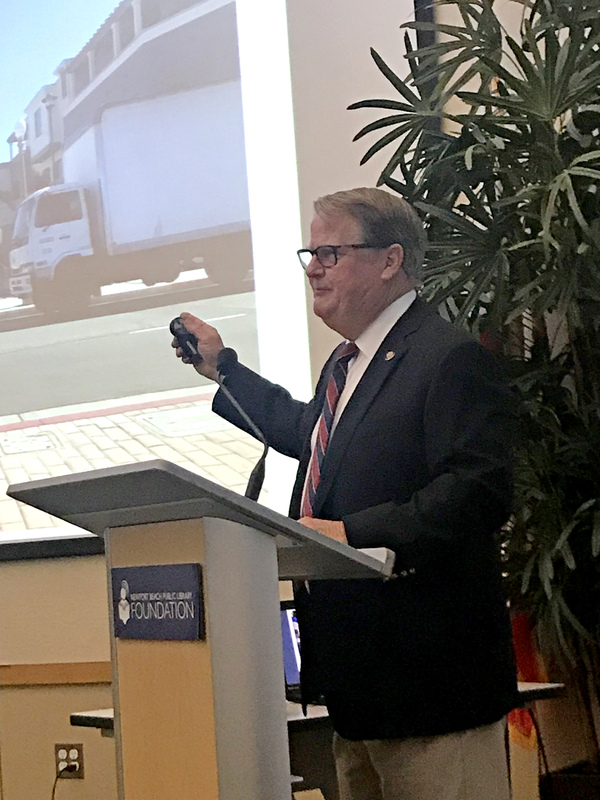 Mayor Marshall “Duffy” Duffield talks about local issues, focusing on harbor-related topics, at the Newport Beach Chamber of Commerce Wake Up! meeting on Thursday. Mayor Marshall “Duffy” Duffield began his presentation to the attendees of the monthly Wake Up! Newport series hosted by the Chamber of Commerce on Thursday morning with a confession. “I don’t really like this room that much,” he said of the Friends Room at the Newport Beach public library central branch. Four years ago, he explained, he nervously spoke at a city council election forum and was the only candidate with a written speech. He stayed true to that sentiment, but still gave the customary state of the city update that all mayors give, including an optimistic view of the looming unfunded pension liability that all California cities face. 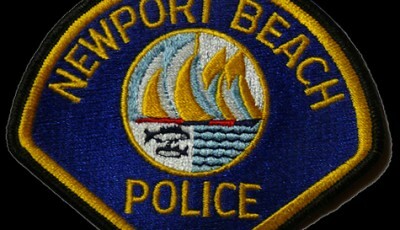 Newport Beach currently has a $400 million bill that will take decades to pay. “We are one of the fortunate, maybe…the only city that can make headway against this nightmarish bill that we have to pay,” he said. The city is “socking away” about $9 million a year. “In 20 years, we might have an answer for you,” he said. 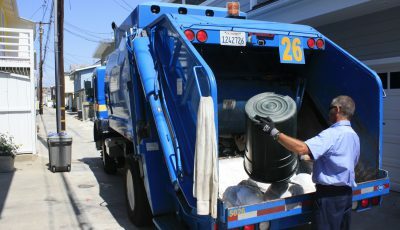 Duffield touched on other issues, such as the city’s efforts to reduce noise from departing flights at John Wayne Airport, and the water wheel, a garbage-removing device that is set to be installed in the harbor between Jamboree Road and MacArthur Boulevard in the coming year. He also joked about updating fire stations and the Corona del Mar branch of the city’s library system. “We were all voted in because we weren’t going to spend any money,” he said of his city council colleagues. “Turns out, we’ve got all these projects going on. But the moneys there,” he noted. As founder and owner of Duffy Electric Boat Company, the largest electric boat company in the world, Duffield’s concerns and ideas centered around the harbor, where he has spent most of his life. He lamented that over the last 30 years, residential property has taken over the character of the harbor. 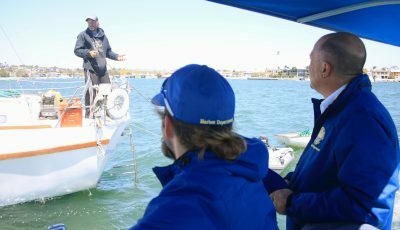 He said he understands the desire to own property that increases in value, and that residential property is more desirable in that aspect, but he misses the boat and marine-focused businesses that dotted the harbor side in decades past. Boat yards and related businesses can no longer afford to operate in Newport Beach, so they move to Costa Mesa or Dana Point. Duffield went on to explain to the attendees, the majority of which were students from local high schools, how residential development replaced vacated marine business plots. Residential developers are more likely to build on the water because the investment is more profitable than that of a marine business. Much of the formerly commercial property was rezoned to become “mixed-use,” or part-commercial, part-residential property. “So we have people living above commercial operations. It doesn’t really work out,” he said. He referenced The Vue, a new waterfront mixed-use property that, according to The Vue website, has sold 10 of the 27 home units available. “It’s pretty much empty,” he said of the development. He shared photos of the property’s commercial floor that showed no commercial activity at all. “You get bottom paint, paint spray, and everything else. It’s mixed use, but it literally has a problem. What ends up happening is that people living in the homes get all riled up and they kick out the boat yard,” he explained. Shock Boats, which has been in business on the harbor since 1946, is “on the chopping block,” Duffield said. A mixed-use building with commercial space on the first floor and residential on the second is the works, he said, although the developer has more than one challenge ahead of him, and that Shock Boats is currently still in business. “That’s our future,” he said. “What I’m trying to do is stir up the pot, and recognize that those properties that we have left on the water, we really, really need to work hard to retain the commercial recreational marine portion of that,” he said. “We don’t want to be like Huntington Harbor,” Duffield said. 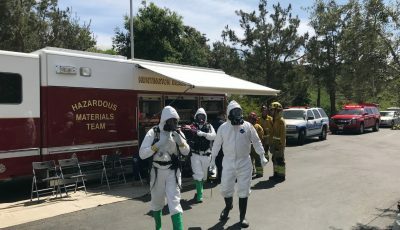 “As great as Huntington Harbor is, it has one restaurant, one boat yard, and if we end up like that, I’ll be very sad,’ he said.